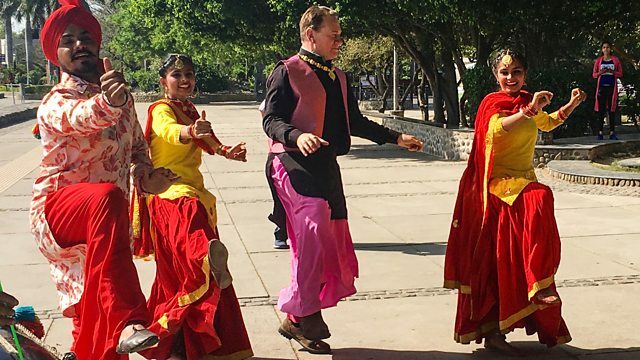 Guided by his Bradshaw's 1913 Handbook of Indian, Foreign and Colonial Travel, Michael Portillo travels across India. He embarks on a classic rail journey from Amritsar to Shimla. Along the way, he helps to feed the thousands at the world's largest free kitchen and travels the railway routes used by millions of migrants partition. He gives his trademark colourful wardrobe an Indian twist and reaches the foothills of the Himalayas, where the epic Kalka to Shimla hill railway carries him to the former summer seat of the British rulers of the Raj. Published when the British Raj was at its height, Michael's guide leads him to some of the key locations in India's 20th-century story, from the massacre in Amritsar in 1919 to the bloody events of partition. At Kalka, Michael glimpses the Himalayas for the first time and joins the 1906-built mountain railway for a stunning climb to Shimla. There, he relives the days when the creme de la creme of expatriate society went to socialise and rule - their exploits recorded by a young Rudyard Kipling.